Ever since she was a little girl, Sloan Polvado has had an obsession with fashion – specifically, shoes. Sloan has always wanted to work in the fashion industry and this summer has had the opportunity to fulfill that dream. 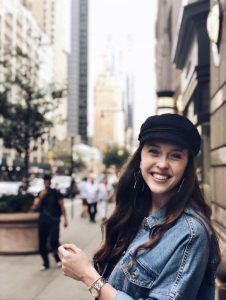 Sloan, a junior marketing major from Sugar Land, is interning with Steve Madden in New York City in the production department. She aids in preparing the production schedules, helping set up timetables that allocate Steve Madden resources to manufacture and sell their shoes. Sometimes, Sloan will get to try on the new designs and give the design team feedback on them and recommendations for adjustments. Sloan has loved getting to learn more about the fashion industry. “It has been awesome to see all of the work that goes into creating a shoe – the different materials and styles as well as the numbers and math – and taking it from design to a store,” says Sloan.